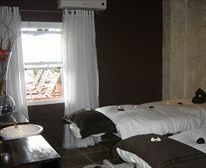 Situated on the edge of the scenic Knysna Lagoon in Thesen Island Harbour town, Le Spa Tranquille welcomes you. All the therapy rooms have picturesque views of the lagoon which, combined with our therapists expert touch, guarantee a soothing experience leaving you feeling rejuvenated and de-stressed. Relax on a lounger on the pool deck and soak up the view before and after a pampering treatment or unwind in a soothing Hydrotherapy Jet Bath or even an eucalyptus infused Sauna cabin before beginning treatments. Le Spa Tranquille has a wide range of treatments on offer to ensure all needs are met. We also cater for groups, personal needs and requests. Our friendly staff look forward to meeting and spoiling you. Morning: Healthy Breakfast/ Steam Sauna Room/ Clarins Fruit Salt/ Scrub and a Vichy/ Shower/ Relaxing Back, Neck and Shoulder Massage/ Aromatic Manicure/ 3hr50min. Afternoon: Healthy Lunch/ Clarins Pro-Facial or Guinot/ Hydradermie/ Facial/ Pedicure/ 3hr15min.